Face wash and face masks are two items which I like to experiment with the most. Having a good face wash in your skin care routine can make a whole lot of difference to your skin since we use it twice daily. Moreover, if the face wash is something that you love, with a pleasant fragrance, texture and nice results, it makes you look forward to your face wash time everyday. 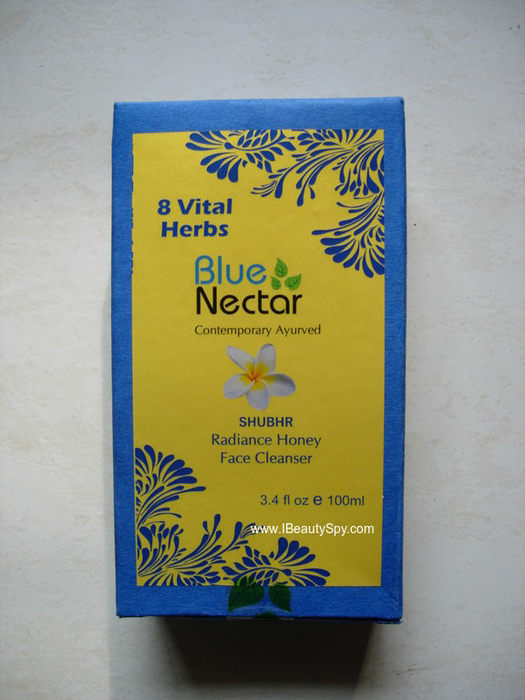 Today, I will be reviewing a natural, sulfate free, paraben free facial cleanser – Blue Nectar Shubhr Radiance Honey Face Cleanser. Its been a while since I switched to sulfate-free face washes. And believe me, it can make a whole lot of difference to your skin texture and quality. 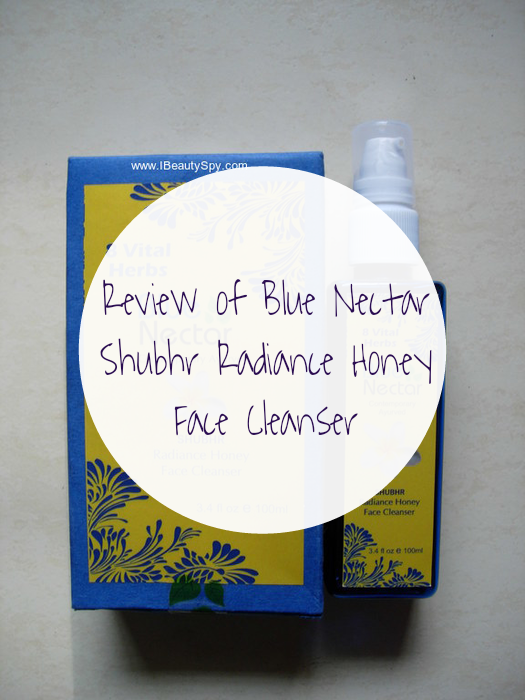 So let’s move on to the review of Blue Nectar Shubhr Radiance Honey Face Cleanser. Shubhr means radiant. Face is the most attractive feature of human body. First step in Ayurvedic face care is to cleanse, tone and nourish the skin. Proper cleansing and toning is done by removing dead cells, clearing clogged pores , removing toxins & pollutants without stripping the skin of natural oils and moisture content. Enzymes in raw honey clarify skin and keep pores clear and clean. Honey is loaded with antioxidants, enzymes and other nutrients that nourish, cleanse and hydrate the skin. Nagkesar acts as anti inflammatory and anti bacterial properties and helps in clearing skin. Anantmool is natural blood purifier and removes heat and inflammation from skin. Aloevera is an excellent moisturiser and its antimicrobial property helps in treatment of acne. It contains vitamin C & E and helps to diminish the lines and wrinkles leaving skin soft, supple and hydrated. Rose essential oil is refreshing and uplifting. In all, 8 vital herbs as mentioned above helps to provide radiance and glow to face by cleansing it and nourishing it with vital ingredients to make face firm/acne free – suitable for every day in ones life. 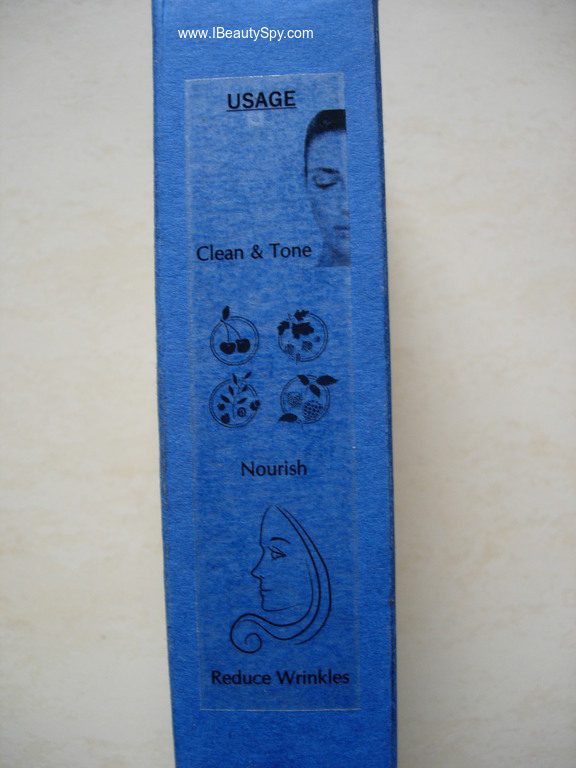 The face wash comes in a sleek plastic bottle with a pump dispenser which is very convenient. 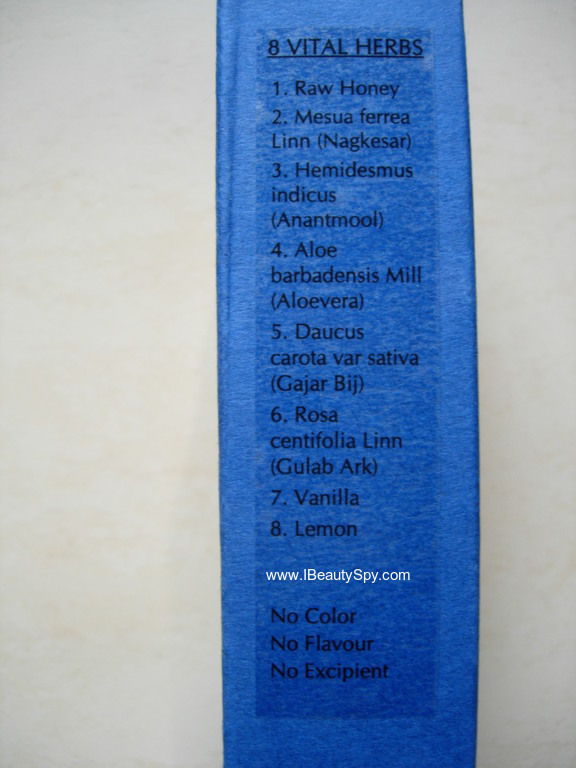 The bottle is housed inside a blue outer carton with pretty graphics. Very travel friendly and convenient. Full marks for the packaging! The face wash is golden yellow color and gel-based, looks just like honey. However, the texture is not sticky like honey. The consistency is medium, not too runny nor too thick. It lathers well and cleanses your skin deeply removing all dirt, dust and grime. It gets washed off easily without any residue. My face feels clean, fresh and also radiant as claimed. The radiance is due to the fact that it contains many hydrating ingredients like aloe vera, honey and rose that doesn’t dry out the skin and also nourishes it. My face had a natural glow and radiance which only face packs usually give. And it also made my skin super soft and I felt like touching it again and again. My skin texture has improved a lot, became smooth and soft. As mentioned in the claims, I can feel that it also tones my skin and makes it firmer. I haven’t faced any breakouts while using it. A face wash doing so many things is really awesome. I enjoyed the results of the face wash so much that I look forward to every morning and evening when I can wash my face with this and feel my skin soft and like a princess 😋. In my opinion, if you can’t go for the expensive Kama Ayurveda and Forest Essentials face washes, you can try this as it gives similar effects at a lower price. Also, additionally, I love that its a sulfate free, paraben free facial cleanser. The only con I find is that they have just one variant of face wash and I don’t think this will be suitable for all skin types. Since I have dry skin, it works perfectly for me. But for oily-acne-prone skin people, it might not fare well. Finally, you might ask how a face wash lathers when it doesn’t contain sulfates. 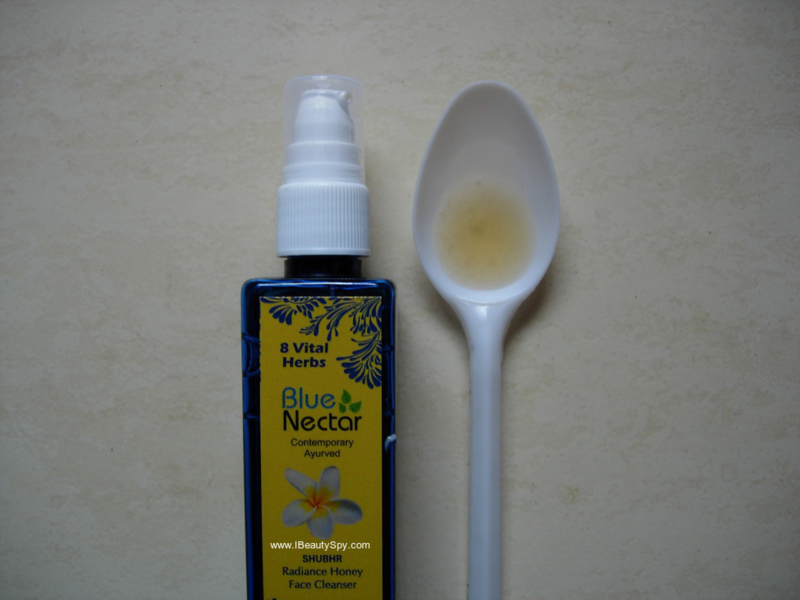 I contacted the Blue Nectar team and they said the surfactant used is Coco Glucoside and natural Ayurvedic surfactant. Coco Glucoside is a natural, non-ionic surfactant derived from coconut oil and fruit sugar. It has a low irritation score unlike SLS/SLES. * Sulfate free, paraben free facial cleanser. * Convenient and attractive packaging. * Makes skin clean, fresh and radiant. * Adds radiance and natural glow. * Makes skin super soft and bouncy. * Tones skin and makes it firmer. 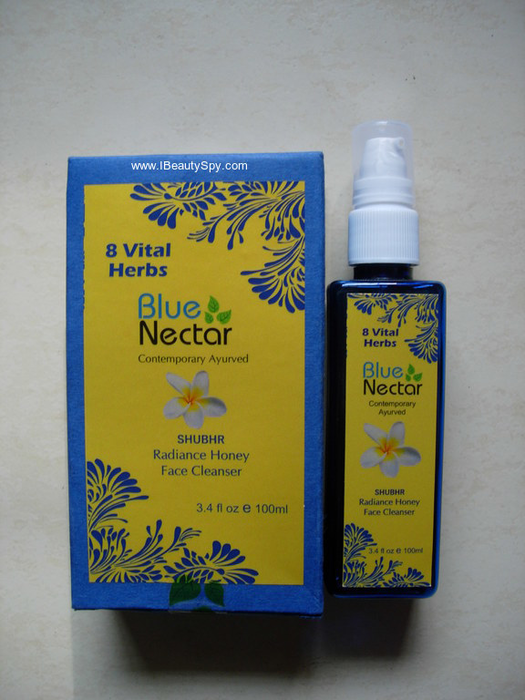 * Contains goodness of 8 vital ayurvedic ingredients. * Introduce more variants of face wash for every skin type. This might not suit very oily, acne-prone skin. Yes, definitely. For all skin types except very oily, acne-prone skin. Yes, after my current stock of face washes get over. Its a bit expensive compared to normal face washes. But if you compare it with other similar natural, ayurvedic brands like Kama Ayurveda, Forest Essentials, etc it is value for money. Especially, considering the awesome results and the fact that it is a SLS free, paraben free facial cleanser. 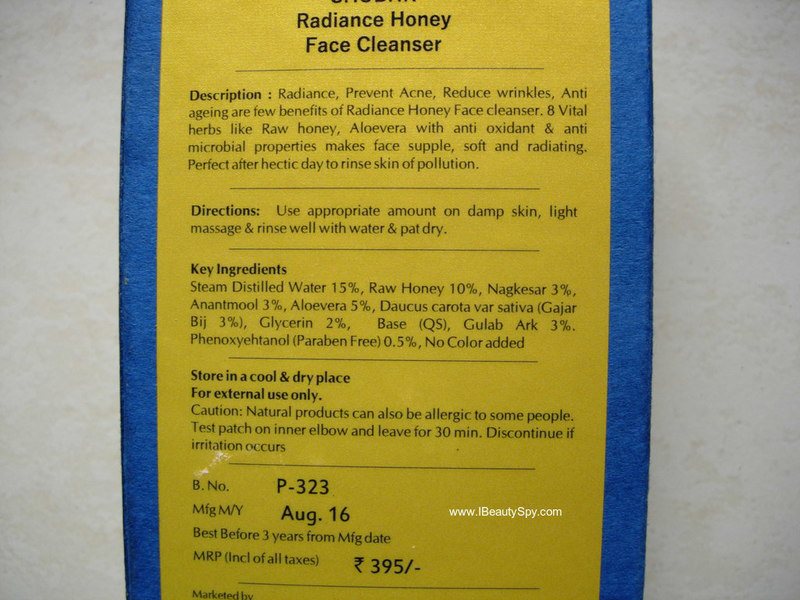 I totally loved using Blue Nectar Shubhr Radiance Honey Face Cleanser and am eager to try out more products from this brand. 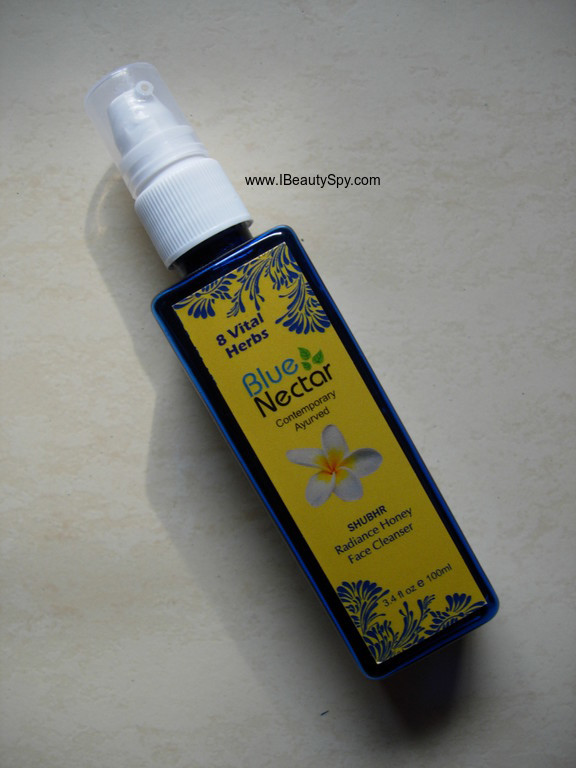 Have you tried Blue Nectar Shubhr Radiance Honey Face Cleanser? Do you love using sulfate free, paraben free facial cleansers? Do share your experiences in the comments. Never hear of this breand before but like the sound of honey cleanser. Seems like a good cleanser .. I have a combi skin ..not sure if it will be best suited. Sounds like a great face wash. I hope they launch more variants soon. If it gives the same results as the Kama Ayurveda, it would be a good option to consider. Your review helped! The product seems to be too good! Wow soo many good things about it. I gotta try this some day.